Protecting those who work in our Nation's mines requires an awareness and understanding of the conditions which endanger their health and safety. This problem was recognized as early as 1865 when a proposal for a Federal mining bureau was submitted to Congress. But it was not until 45 years later that a series of mine explosions led to passage of the Organic Act of 1910. That Act created the Bureau of Mines. Laws passed over the next six decades enlarged the scope of legislation aimed at reducing mining hazards. 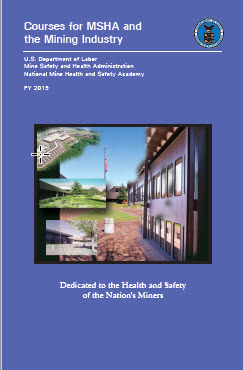 The National Mine Health and Safety Academy, at Beckley, West Virginia, evolved from those laws. Dedicated in 1976, the present Academy complex houses the largest educational institution in the world devoted solely to health and safety in mining. The Academy serves as the central training facility for federal mine inspectors and mine safety professionals from other government agencies, the mining industry, and labor. Academy staff provides classroom instruction and produces videotapes, slide presentations, publications, and other training materials. These classes and materials cover safety and inspection procedures, accident prevention, investigations, industrial hygiene, mine emergency procedures, mining technology, management, and many other subjects. All of these items are designed with one central theme in mind to promote and enhance the health and safety of those who work in our Nation's mines. The courses listed are designed for journeyman mine inspectors and Federal, state, mining industry, and labor organization personnel.